Photo shows UNC mens basketball coach Roy Williams delivering his speech upon being enshrined to the Naismith Memorial Basketball Hall of Fame as part of the class of 2007. Finding a new home in Kansas, where he established himself as a great leader of college basketball teams before his home away from home — Chapel Hill — called him back not once but twice before he agreed to return. And what a homecoming – the continuation of a HOF career highlighted by his first two national championships as coach of North Carolina. At age 64, Williams has been called home again, to be recognized and honored for a lifetime of success and achievement in the game he loved so much he would sneak as a kid. 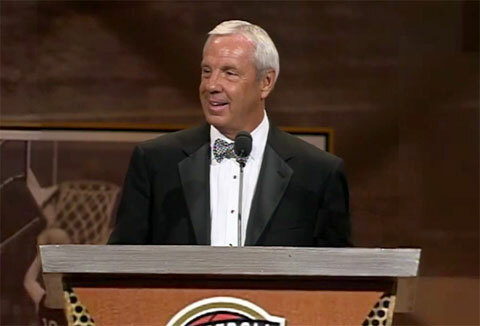 Watch the following video where Roy Williams delivers his speech upon being enshrined to the Naismith Memorial Basketball Hall of Fame as part of the class of 2007. Roy Williams has served as men’s basketball coach at North Carolina since 2003 and has won two NCAA titles. He previously served as head coach at Kansas for 15 seasons. Playing Field Promotions is a booking agent for motivational sports speakers and celebrities. If you would like to book Roy Williams for a speaking engagement or personal appearance, contact Roy Williams’s booking agent for appearance & speaker fees at 1.800.966.1380.